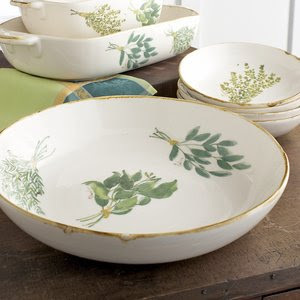 Spring Herb Italian Ceramics from Sur La Table. Spring is here so why not brighten your table with these beautifully painted ceramic dishes? They come in cream and are painted with basil, sage, rosemary and thyme. They have a natural, slightly worn charm to them which is what I love. Bon Appetit! so pretty! i love the vintage feel. I love these plates, the colors are so subdued and beautiful!